Looking for interior timber? Here at UK Timber we are proud to manufacture many different furniture items, quality solid oak flooring, internal oak doors, traditionally jointed and crafted, green oak table, lamp stands and solid machined cladding in many different styles and materials. Please feel free to contact us if there is a specific item required that is not online. Chances are we can make it! The machining of solid oak flooring is a precise art, it has taken us a lot of time and effort to get to our current level of knowledge and expertise. Solid Oak Flooring is sought after for that precise reason, it has a character all of its own and a beauty that is unsurpassed. 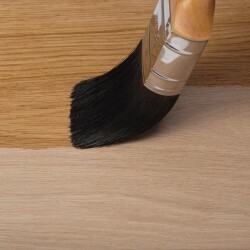 Here at UK Timber, we supply our solid oak flooring completely unfinished for you to be able to apply your own finish to bring out the beauty of this most versatile of wood and for that exact colour match, etc. We also sell a range of Treatex Hardwax Oils available in a wide range of colour tones. 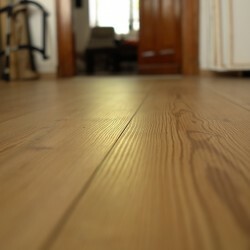 We offer two different types of oak flooring grades: Character grade floor boards and Rustic grade flooring. 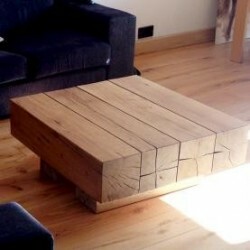 We supply quality European Oak or American White Oak flooring, in a selection of set widths. Please take the time to shop around other flooring companies before you visit us - it is only then that you will notice the difference (especially in the price), and the consistently high quality that we offer, all our standard floors consist of primarily longer than 2 metre boards and we have almost every board size and grade in stock almost all the time in order to machine your order with minimum fuss and minimum waiting time! 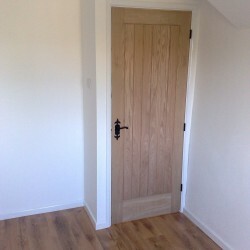 At UK-Timber we offer a wide range of Solid Oak Internal Doors to fit your every need. Whatever you wish to use the door for we have an option for everything, from using them for a contemporary or traditional house to a barn conversion or simply for cupboards and wardrobes, there are doors which fit all these needs. Our hand crafted doors are available in an extensive range of designs and sizes, all of which are manufactured from character grade European oak which may contain features such as knots, splits, and worm track. Our European Oak has been kiln dried to 10% moisture content making the doors extremely stable which minimises any bowing or warping after installation. All UK-Timber doors are 42mm thick, this comprises the main door of 20mm and the ledges of 22mm. The vertical 20mm boards have a micro bevel on the corners giving a V-Groove appearance and the external boards used for ledges, braced and frames are fixed with screws to the vertical boards and then wooden plugs are used to fill the screw holes. Bespoke size doors can be made to any required size please call or email with your requirements. Our solid oak doors are supplied unfinished ready for final finishing. It is recommended that the doors are finished with a wax, varnish or oil – you will find a full range of treatex products here. If properly cared for, your oak ledge and brace door will last for hundreds of years. Also to complement your door we offer an extensive range of hand made ironmongery including cabinet handles, knobs and hinges, door hooks, hinges, locks and latches, door bolts and much much more. We believe our solid oak doors are representing great value for money, because of the great quality which we are proud of. Looking for internal cladding? 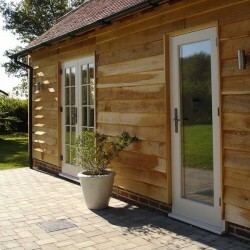 Our range of kiln dried oak cladding is ideally used for internal purposes only. Our Oak is both a highly durable and naturally long lasting hardwood. We also supply a range of external half lap cladding for external applications. For any questions on the product range, call us on 01536 267107. UK Timber operates its own fleet of crane offload vehicles providing quality delivery service to all of its customers. Shipping cost will remain the same whether 10 sleepers or 50 are ordered. If you are looking for full loads you should either telephone or email for a quotation. Treatex offer some of the most beautiful, hard-wearing and easy to maintain wood finishes available in the UK. These Treatex Hardwax Oils can be used to preserve and enhance the natural and original appearance of many types of timber surfaces - such as oak beams. Treatex manufacture their oils from natural sustainable materials such as beeswax, linseed oil, sunflower oil, carnauba wax and more. These oils are easy to apply, highly durable, easy to clean, quick drying, and spot repairable. We supply Treatex Hardwax Oils in a wide variety of colours and finishes, and they are available in 0.45L, 1L and 2.5L containers.